• 11 people like this. Do you like this? 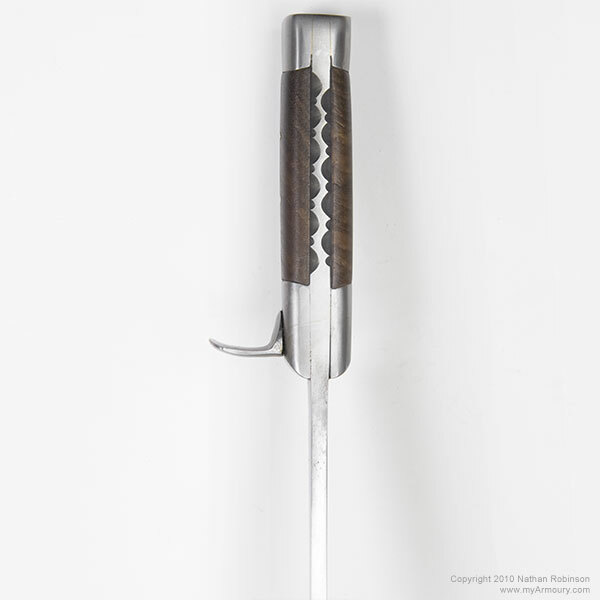 Men of the medieval period carried a knife or dagger both as a utilitarian tool and as a defensive weapon. 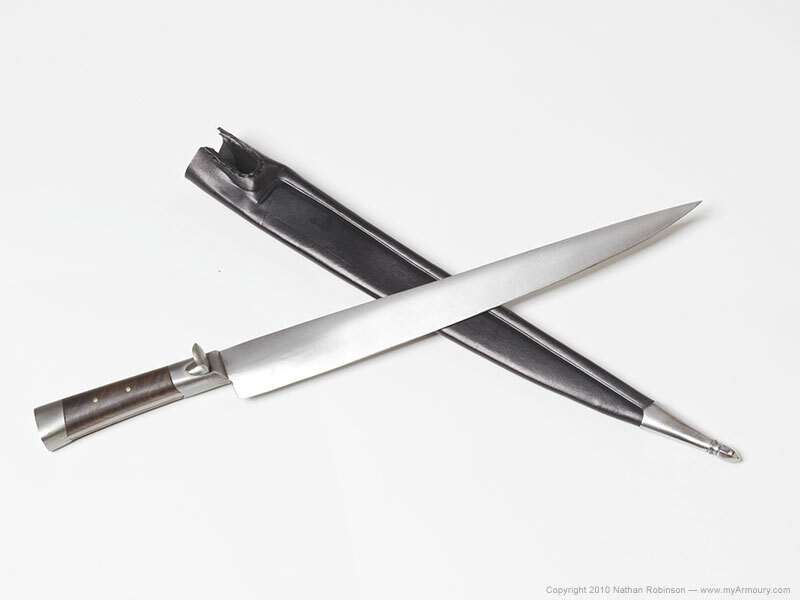 One of the most common forms of these everyday weapons would have derived from the single-edged domestic knife. 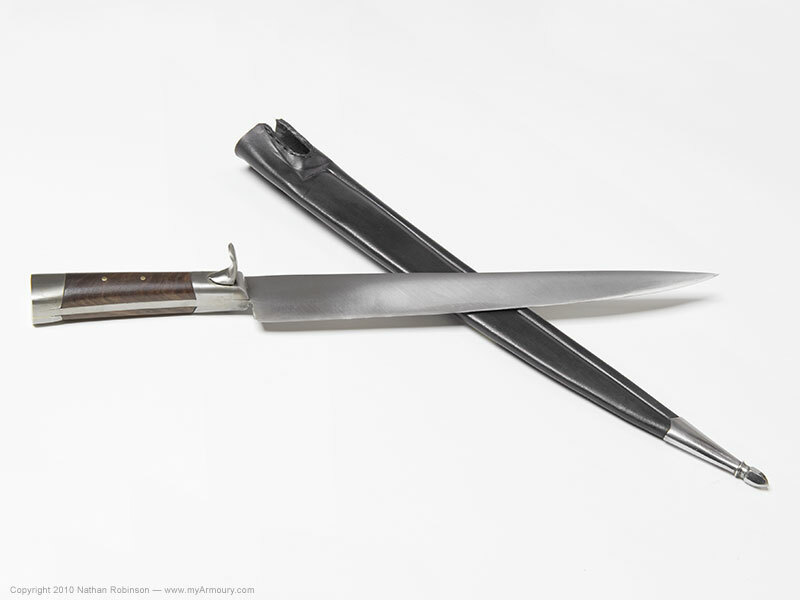 In German texts these knives are referred to as hauswehr, which roughly means "home defense weapon." These weapons are found throughout historical art and appear to be nearly ubiquitous amongst all classes of men including civilian townspeople, peasants, and farmers. 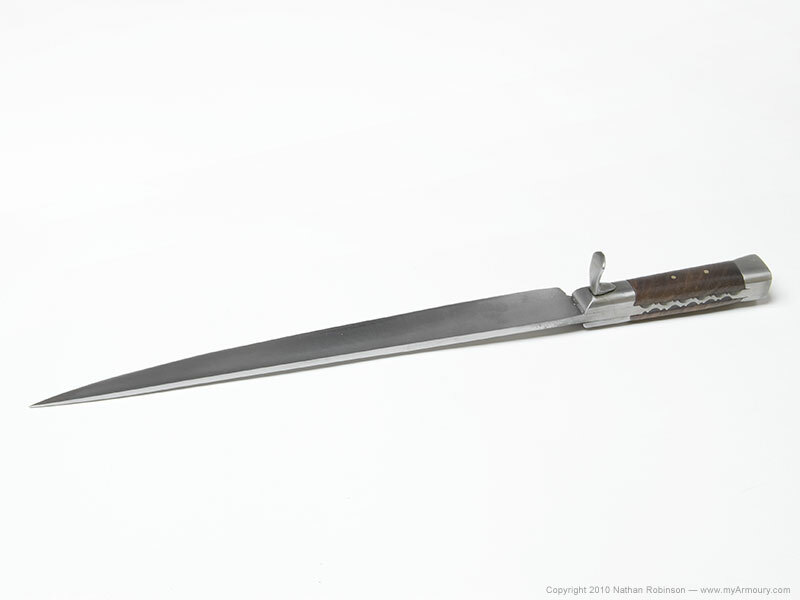 The hauswehr is generally defined as having a relatively long single-edged blade of wedge shape with nearly parallel edges that curve suddenly to meet at a sharp point-section. The broad tang is mounted with scales of an organic material (wood, bone, horn, etc.) that are attached with rivets. Many examples have what is called a nagel: a lugged projection that extends at a right angle from the blade to form a rudimentary guard. Some German and Swiss texts dating from the 16th century refer to these knives as rugger, ruggner, or ruggerli. 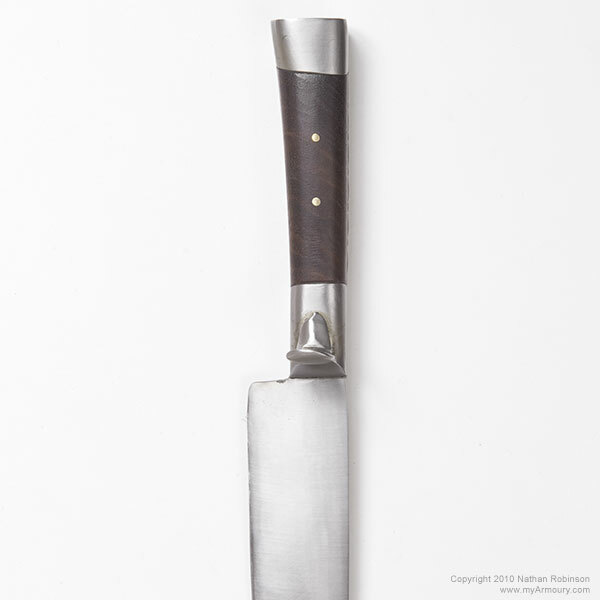 The knife shown here is a simple form that almost resembles a modern-day steak knife. Its long blade is stout and sturdy with a triangular cross-section characteristic of the type. The edge is very fine and sharp, capable of performing everyday chores or being an effective weapon. 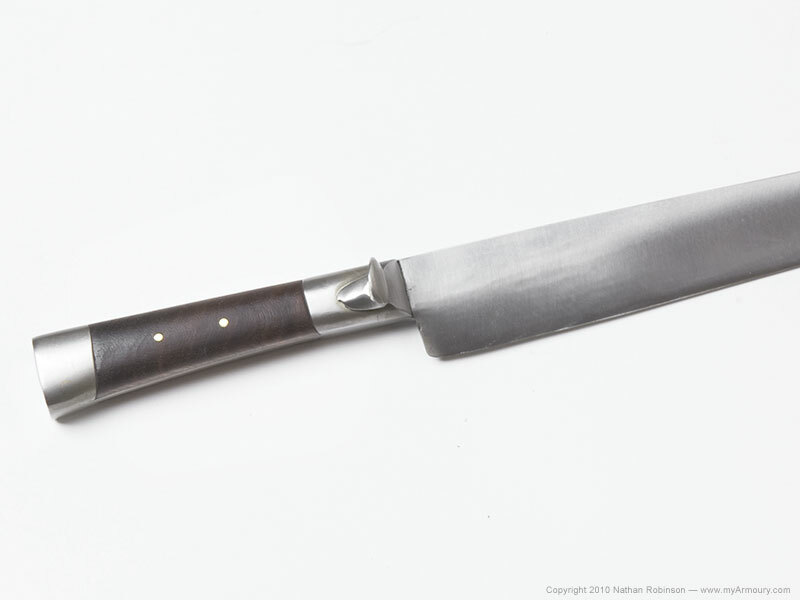 The grip is made of walnut and was chosen to closely match a grosse messer from my collection. The nagel is a simple rounded form and extends through the guard where it is riveted cleanly on the other side. The spine of the tang has decorative filework that is visible between the grip scales. 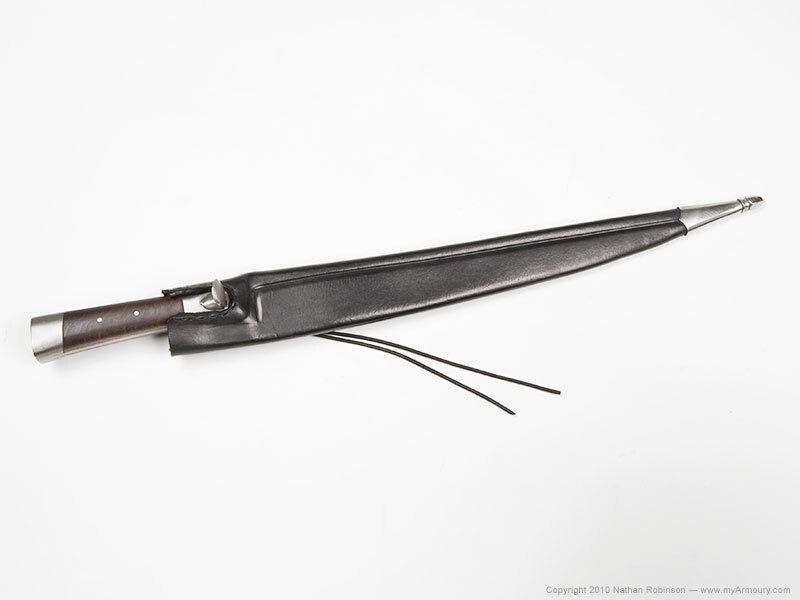 The knife fits deeply into a double-leather scabbard created with a cut-out for the nagel. A decorative metal tip with a faceted finial adds a bit of flare to an otherwise austere piece. Blade: 11.5" long; 1.25" wide tapering to .5"
Maker: Tod's Stuff of Oxford, United Kingdom. This item has been retired from the collection.